With good diving conditions on all but a few days a year, a cornucopia of marine life and an exciting mix of underwater topography and wrecks, it is surprising that diving is not more readily associated with the British Virgin Islands. The islands’ location between the Atlantic Ocean and the Caribbean Sea has given rise to a wealth of reefs that are home to countless species of marine life, preserved by BVI government restrictions on fishing and spearing. ‘You’ll see massive lobsters, beautiful fish, healthy populations of conch and rays and turtles. We have also found many unknown species of Nudibranch and various soles and sea slugs here!’ says Casey. 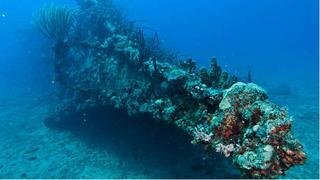 BVI waters have numerous wrecks, old and new, with one of the most famous being the RMS Rhone, a royal mail packet ship that sank in a hurricane in 1867 and which, 99 years later, was a location for Peter Yates’ film The Deep. 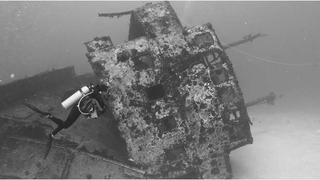 Considered by many to be the best wreck dive in the Caribbean, the Wreck of the Rhone has its fair share of marine occupants and divers can still see numerous artefacts on board. Two dives are recommended to experience all it has to offer, with a swim through the amazingly intact bow section and under the stern near the huge propeller recommended on the first dive, and an exploration of the artefact-filled mid section with an octopus sighting if you are lucky on the second. Novices might prefer to explore the aeroplane wreck south of Great Dog – the stripped down fuselage of a small inter-island commuter plane that ended up in the water after an abortive take-off (no-one was hurt) and having languishing as a wreck in a hangar for some time, was scuttled to create a dive site which is the focal point for an abundance of marine life, including a number of barracuda. The nearby coral garden is home to a wide range of reef fish, lobster and the occasional nurse shark or turtle. Among the less well known wrecks to dive is the Chikuzen, a 75 metre Japanese refrigerator vessel that was scuttled 12 miles off the Northern shore of Scrub Island. Its relative remoteness means dives are dependent on very good conditions, but being away from the more popular dive waters has ensured a flourishing population of marine life. 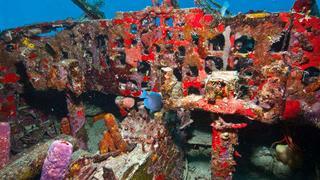 Wreck Alley is the place to go for a four-in-one wreck diving experience. Lined up on the sea bed are Marie L, a scuppered cargo boat, Pat, a tugboat, the Beata and the Island Seal. A large colony of garden eels has established itself in the area and the site is frequented by some brazen stingrays which nonchalantly swim through groups of divers. Nearby, the 1996 wreck of the Inganess Bay lies in two halves and has proved to be exceptionally photogenic. Aside from the man-made structures there are an astonishing variety of natural ones, the most well known being ‘The Indians’, an amazing array of coral spires off Norman Island. Amongst numerous other sites, the Dog Islands offer The Chimney – a canyon which turns into an unusual natural archway covered in multi-coloured sponges and delicate orange cup corals, and the imaginatively named Flintstones, an area of boulders said to resemble Fred and Barney’s home of Bedrock. Near Great Camanoe is the grotto of Lee Bay, formed by ancient lava flow, through which light filters to create a cathedral-like atmosphere that is enriched by the spotted lobsters, banded coral shrimp and glassy sweepers which inhabit its nooks and crannies. Sink holes allow divers to drop down into the mini maze of the reef itself. A lost and still elusive diamond ring gave its name to Diamond Reef, situated not far from Scrub Island. You could try your luck finding it or spend your time more rewardingly along the 180 metre reef wall, which is clad in a profusion of hard and soft corals and teems with tropical fish. Dives around the more exposed Cooper Island and Carvel Rock are rarer and more challenging, and they can only be undertaken if conditions are very calm. However, divers taking the plunge off the east side of Cooper Island at Dry Rocks East will be rewarded with sightings of some of the more unusual marine life from horse eye jacks to African pompano, Atlantic spadefish, hawksbill turtles, shark-like cobia and nurse sharks. The intriguingly named Devil’s Kitchen is a shelf, which progressively becomes more undercut with the rock structure forming a bizarre ‘swiss cheese’ lattice providing numerous hideouts for reef fish and lobster, large snapper, turtles and tarpon. 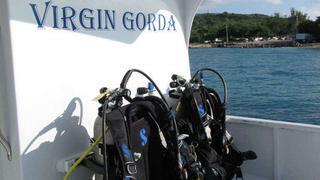 Local knowledge is key to the best and safest dives, and local company Dive BVI has it in spades. Founded in 1975 by owner Joe Giacinto, the company offers standard scheduled dives, private boat charters with guides or instructors and rendezvous diving, where the dive boat, staff and dive equipment come to your yacht and lead you on a tour of the best dive sites, taking all the hassle of organisation and planning out of the equation. Dive BVI specialises in wreck and reef diving, but also offers guided audio tours, night dives and specialist instruction in underwater digital photography, deep diving, dive propulsion vehicles and even Reef Check Eco Diver courses. There is even an SSI Enriched Air Nitrox course, which trains divers in the use of Nitrox to increase their dive times. 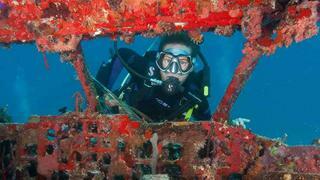 More advanced diving courses can be taken over an extended period of time, although many of these can be started online. Courses range from beginner right up to instructor level, with divemaster and instructor courses usually take up to eight weeks of intensive dive training, which includes shadowing staff in their roles. For those who have never been diving before there is a ‘Try Scuba’ course for anyone aged ten and above. After just an hour of learning the basic skills, the instructors will take novices for a shallow reef dive. There are even opportunities for children under the age of 10 to try out a Scuba Rangers programme for essential scuba skills in a contained pool. Peak season is usually between mid December and April for sailors and during the summer there are often lots of families with children learning to dive so booking a charter around October or November would be ideal to miss the crowds. All Dive BVI staff are Emergency First Responders and work with VISAR (Virgin Islands Search and Rescue) to ensure that their training is maintained and up to date. Casey states that, ‘Dive BVI has a 100% safety rating when it comes to serious accidents – we keep our ratios of divers to guides lower than most to provide attention to our guests.’ Its boats have the latest safety gear and it is careful to choose sites that will provide enjoyable rather than stressful dives. It is important that any individual who is asthmatic or has any history of pulmonary or cardiovascular problems has sought medical advice to ensure they are fit for diving.